Hailing from Upstate New York, James grew up in Norwich, in a region colloquially known as “the 607,” in-between Binghamton and Syracuse. 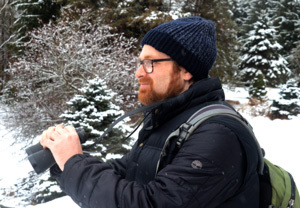 After attending SUNY Plattsburgh, Jamie took off west to Michigan State University to get his masters in environmental journalism. In the process, he spent a glorious year in Iceland working for their English-speaking newspaper The Reykjavik Grapevine, where he had a lot of fun eating skyr, listening to Björk and going on puffin safaris, before jumping ship right as the country went bankrupt. He spent a season in the Emerald City interning at Grist.org -- the quintessential environmental news blog. Later, he moved back to the Big Apple and jumped head first into the media journalism world blogging for Mediaite and Mediabistro.